I’ve said it before and I’ll say it again, I LOVE BRUSSELS SPROUTS! This salad is so exceptional and has a real unique group of flavors. 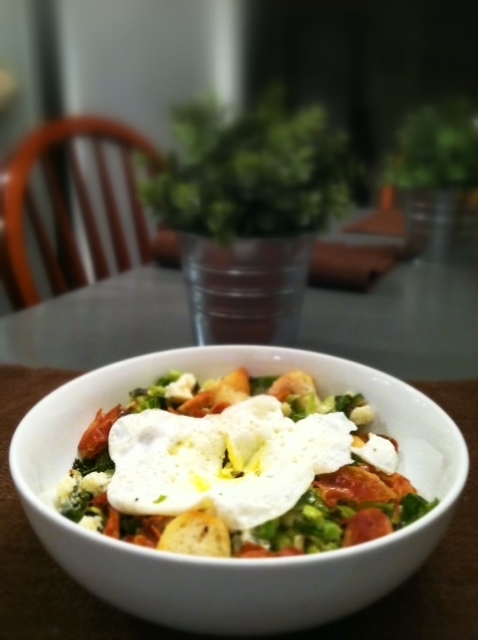 It is very savory and I think it tastes like a treat even though it is easy to make. It takes a minute but it is not difficult at all. 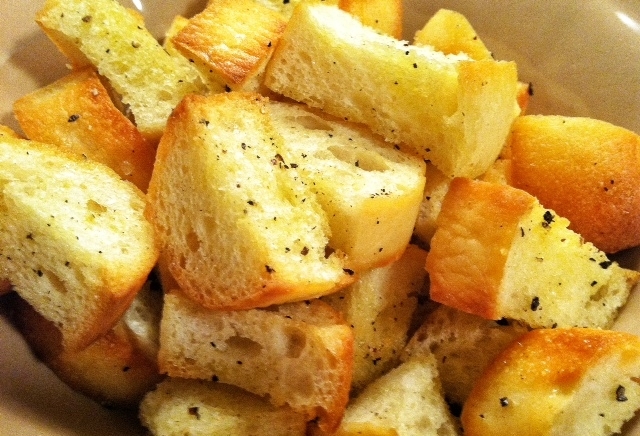 You start out by making your own croutons which is simple enough. I use a mini ciabatta loaf but you could use 1 cup of your favorite bread. I just wouldn’t choose one that is too overpowering (like garlic or asiago) because you don’t want the bread to take up the focus of the entire salad. Making your own croutons is fun because I am a huge dork you can make them as soft or as crunchy as you prefer. 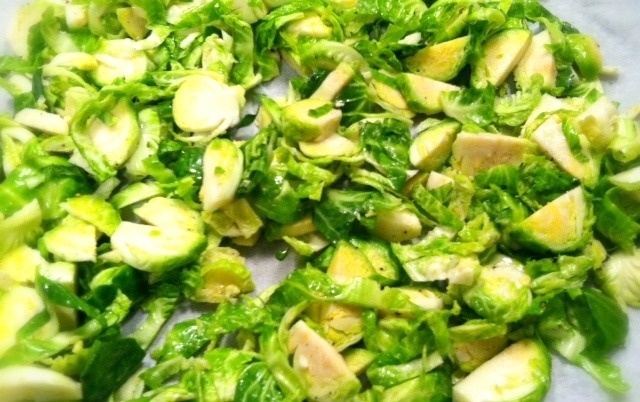 Instead of cutting the Brussels only in half, I shred them so they have a more lettuce like consistency. Pancetta and creamy blue cheese make this salad taste really rich. Try not to buy the crumbled kind. Instead, crumble it yourself. You could certainly leave the salad naked….. But I like to top it off with the perfect “over easy or not over at all” egg. If you cook the egg using this method it cuts out the possibility of breaking the yolk in the pan and ending up with just a fried egg. 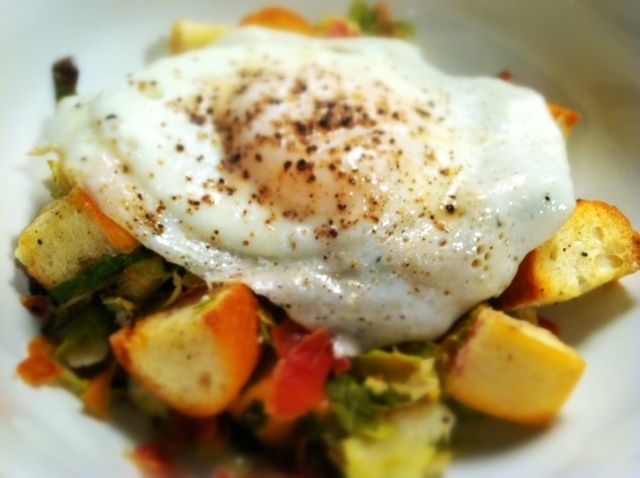 As soon as you top the salad with the egg make sure to poke a hole in the yolk so that it runs down to the salad. 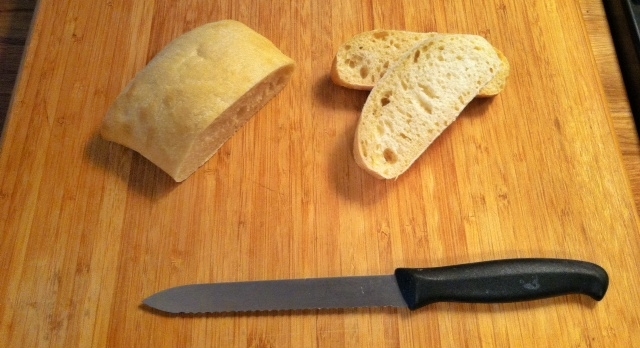 Cut ciabatta bread or any favorite into half inch cubes. In a bowl toss bread with 2 tablespoons olive oil 1/4 teaspoon salt and about 5 grinds of pepper. Bake 10-15 minutes on parchment lined baking sheet until golden and crunchy. Watching closely toward the end. (This step can be done in advance) When they have cooled place in a large bowl. Line a baking sheet with aluminum foil and then with a piece of parchment paper. Arrange Pancetta on the pan. Bake in the oven for about 10 minutes or until crisp like bacon. (This step can be done in advance) Crumble Pancetta. Heat nonstick skillet to medium heat. 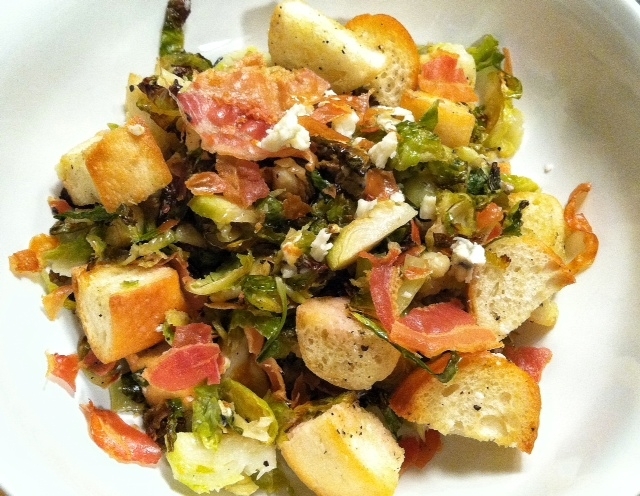 After you have removed the Brussels from the oven, pour them into the bowl over the croutons. This will help the croutons soften a little and absorb liquid from the Brussels. 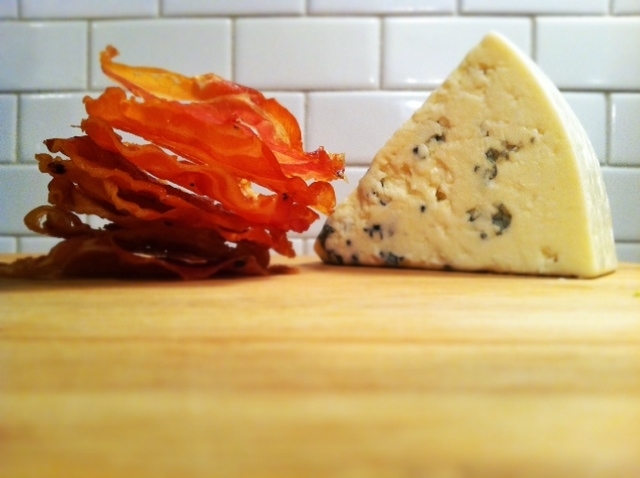 Now, add red wine vinegar blue cheese and Pancetta. Toss to combine. Divide combination between two large salad bowls. Spray the nonstick skillet with cooking spray. Crack eggs, keeping yolks in tact, into pan. Sprinkle with salt and a few grinds of pepper. When the whites become white but yolk is still not cooked add tablespoon of water to the pan and cover with a lid. After 30 seconds remove the lid. Yolk should still be runny. Lay one egg over each salad. Poke a hole in the egg to release yolk. I prefer over easy or scrambled.